Whether your office Information Technology (IT) infrastructure is large or small, our insured and certified computer technicians will setup your servers, computer networking, low-voltage data cabling, wireless networks, printers, security camera systems, security software and telecom systems professionally and will see the job through until completed. Or if your computer systems and/or computer networks are not working correctly or optimally, we will have them back in full working order efficiently and effectively cutting your down-time to a minimum. Do you need a computer or network installed and configured? We’ll get you up and running rapidly with the strictest and most current security implementations. 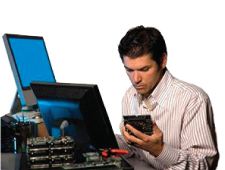 Our certified onsite computer technicians are fully qualified to resolve almost any issue you have relating to your business computer networks and systems. Whether you need helpdesk support, operating systems configuration, data center management, IT staffing, IT outsourcing, security systems, hardware repairs, data recovery or peripheral devices (such as monitors, printers, scanners, cameras, faxes, mobile devices, etc. ), our expert technicians will tackle the job. This also includes mainstream off the shelf or customized software applications as needed. Toronto Computer Service support is a independent third party support provider. We are not affiliated or employed under the brand owners and that all services and support that we provide is readily available with their respective brand owners. Copyright © 2019 Toronto - Danforth Computer Consulting.